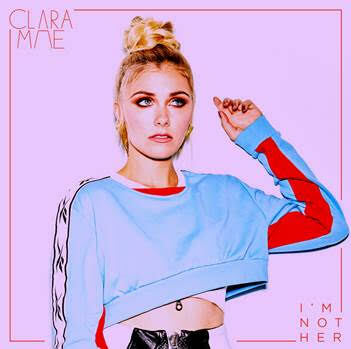 A new talent emerges from Sweden – singer/songwriter Clara Mae – sprouts onto the scene today with her debut single “I’m Not Her” paired with an intimate new music video – WATCH HERE. Out today on Big Beat Records, “I’m Not Her” showcases the imprint’s newest female singing’s signature seductive vocals, raw and relatable lyrics, producing a distinctive blend of electronic and pop music. After spending years studying jazz vocals, piano and writing music in her small town of Gävle, Sweden, Clara Mae garnered attention as a co-write for dignified producers, David Guetta, Tiesto and Martin Jensen. An introduction to Norwegian-based producer duo KREAM later led to a feature (and co-write credit) on their viral track “Taped Up Heart” (LISTEN HERE) which celebrates 80 million streams worldwide! Clara pivots her focus now to writing for herself – discovering the importance of her lyrics being used to tell her story. “I’m Not Her”, stems from the concept of relatability in relationships, and how every human’s natural tendency is to compare one’s self to their former partners new lover. “I’m Not Her” is about embracing who you are, and being proud about the fact there is no one else like you. Clara’s music will continue to pay an ode to relatability as her career as a solo artist unfolds, revealing stories of love, lust and everything in between. “The song concept came from breakup conversations during a writing session – about first getting over someone you’ve broken up with, and you hearing he’s met someone new! So many questions pop into your head, ‘what does she look like?…is she funny?…is he making the same memories with her as with me?’ After a lot of thinking, you realize that she’s nothing like you, and I’m not her.